I know this lesson is usually divided into several, but I needed to cover the Old Testament in one year. Genesis and Moses were a quarter each, and different people in the Old Testament for the other two quarters. So, this is combined into one lesson. There are so many options for this lesson, too! Review: Today, we are in the Old Testament book called Joshua. 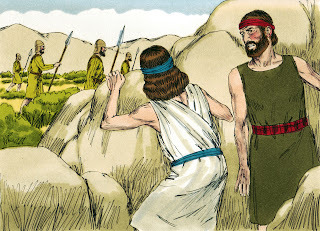 We studied about the 12 spies (one man from each tribe) that went and spied the land of Canaan. They came back with grapes so huge, 2 men carried them on a pole between them! Not all of the 12 spies had faith that God would protect them. The 10 spies lack of faith made God angry, so because they had searched the land for 40 days, God made the people wander in the wilderness for 40 years. One year for every day. 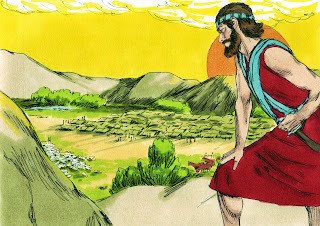 (vs. 34) Jacob and Caleb were the only spies that had faith in God. Lesson: Bible Scripture is Joshua 2-6. Moses told Joshua he would be the next leader. After Moses died, Joshua sent 2 men to spy out Jericho. 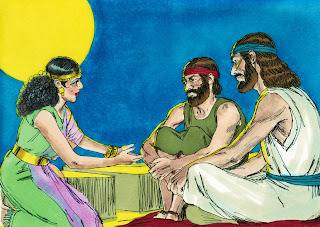 They went to Rahab’s house and stayed there. The king said that there were spies in his city and told Rahab to bring them to him. 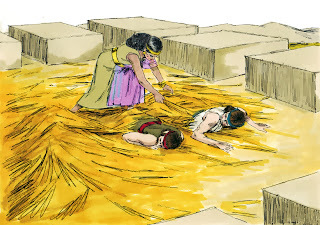 But, she took the 2 spies and hid them on her roof and covered them with stalks of flax. She told the king that she didn’t know they were spies. Rahab said that they had left the city after dark, just as the city gates were being closed. She told him that if he chased them quickly, maybe his men could catch them. 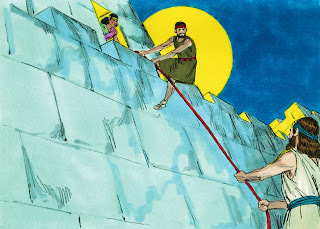 Rahab went back to the roof and told the 2 spies that she had heard about God’s power. She asked if they would save her and her family when they took over the city. 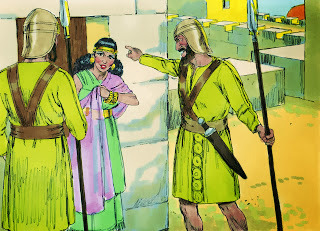 The spies told her “If you keep our visit a secret, we will protect you.” Since Rahab lived on the city wall, she let them down through the window. The spies told Rahab to make sure everyone stayed in her house when they attacked and to leave a scarlet rope hanging from the window so they knew which house was Rahab's when they attacked. Then, they left Rahab and the city and hid in the mountains for 3 days until they were safe. 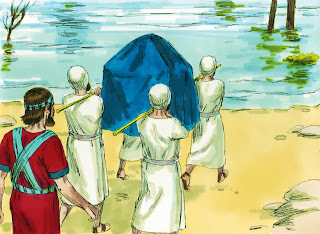 Preparing for battle: The priests were carrying the ark of the covenant and the people were following (vs. 3:14) the priests. 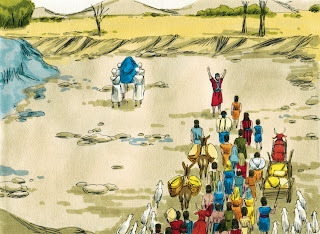 They were going to cross the Jordan River that was always flooded over the banks of the river. The priests dipped their feet into the river, and the water stood still and rose so that everyone crossed over on dry land! Joshua also set up stones where the priests stood with the ark of the covenant in the Jordan as a memorial. (Joshua 4:9) The people crossed the Jordan River, and then the priests with the ark finished crossing the river. God told Joshua to have all the men of war march around the city 1 time a day for 6 days and do not talk. The 7 priests will carry the rams’ horns each day. BUT, on the seventh day, you will march around the city 7 times and the priests will blow the horns. When they make a long blast with the horns, all the people will shout and the wall of the city will fall flat! 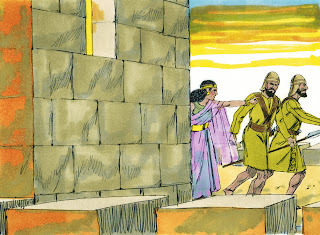 Joshua told the 2 spies to get Rahab and her family and they took them to the Israelites camp for safety. Everyone in Jericho died and they burned the city. When I usually teach this lesson, I have horns and stack up a bunch of boxes. I have the kids walk around 'Jericho' (the boxes) real quiet. We count the days, then on the '7th' day, they blew the horns, and knocked the boxes over! That's just too much fun! But, it is December, and even Memphis was too cold this weekend to go outside! And, it's pretty loud for the other classes. So, if you divide the lessons, there is an idea for each lesson. I made blue Jell-O Saturday night and made it about 2 inches high. Once it was set, I cut it into about 1" wide slices and whatever length you need for the containers you use. I found the 5 pack of containers at Dollar Tree. I bought graham crackers for the 'dry ground' they crossed over and Smarties for the people walking over. I let the kids put it all together and they stacked and glued the 12 Tribes stones worksheet. Click here to print the 12 Stones cut & glue worksheet. You will need a red piece of yarn, string or embroidery floss for this worksheet. Click on above photo for today's Bible verse. Such a great lesson as always. Not sure I could go without talking that long. LOL! The kids have a lot more fun with the shouting part! Thanks for the comment! Thanks for the comment, Angela! I linked up and will be back each week! Thanks for the invite! Hi I am dropping by from the True Aim Education blog hop to personally invite you over to my new blog called Plexus Journey with Ashley. Our focus is on health and weight loss topics, tips, inspiration, and motivation. Come join us and read great stories from all kinds of people and become motivated for the new year. Thanks Ashley! I appreciate you stopping by and the invite! I will have a look at your blog! Thank you! Going to use for our AWANA club theme night tomorrow....it is SPY NIGHT!!! Love to use lessons where I can use the kids to act out or have a hands on activity so it sinks in. So glad you can use it! Thank you for the comment! I appreciate you stopping by! Hello Debbie, I continue to love using your materials for my Bible class that I teach to elementary students. Thank you so much for sharing your materials with other people! I am working on the lessons on Joshua. I have a request for a spelling correction please. When printing the page with the 12 stones from the Jordan River for each of the 12 tribes, I discovered that Reuben is spelled Rueben. Thank you for letting me know. This has been corrected and I will work on the others in this series.